New Qx Series SDI-STRESS option tools include Jitter FFT and Patholgical Detector screens. Phabrix is providing clues to what’s new in its queues for the 2019 NAB Show. The clues were announced for BVE 2019, to be held in London late this month. What’s new is advanced SDI interface stress testing on the Qx Series. A new SDI-STRESS option provides an advanced toolset for SDI interface stress testing which, together with its fast, automated 12G-SDI physical layer analysis employing RTE (Real-Time Eye) technology, provides the best solution to SMPTE compliance verification of 12G/4x3G/2x6G/6G/3G/HD-SDI interfaces. 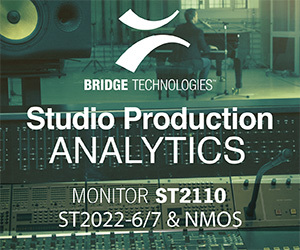 The SDI-STRESS toolset includes SDI jitter insertion (10Hz to 10MHz, 0.01UI to 16UI), eye amplitude adjustment (+/-10%), pre-emphasis, signal invert and mute features operating with either the video pattern generator with pathological overlay as source or a new PRBS Signal Generator (PRBS7, 9, 15, 23, 31), coupled to a new BERT Analyzer tool. In addition, a new Pathological EQ/PLL condition detector with real time trigger over GPI out is provided. Also new is an Enhanced HDR Toolset that adds to the already comprehensive PQ HDR toolset. The Qx Series now offers support for Hybrid Log-Gamma (HLG), S-Log3 and SR Live, enhancing the visualization and analysis of 4K/UHD and HD content. The Sx Series now offers a Audio/Video Delay option. It combines a programmable AV test signal generator with an automatic AV delay analyzer, providing the ability to track audio to video timing within a signal chain.